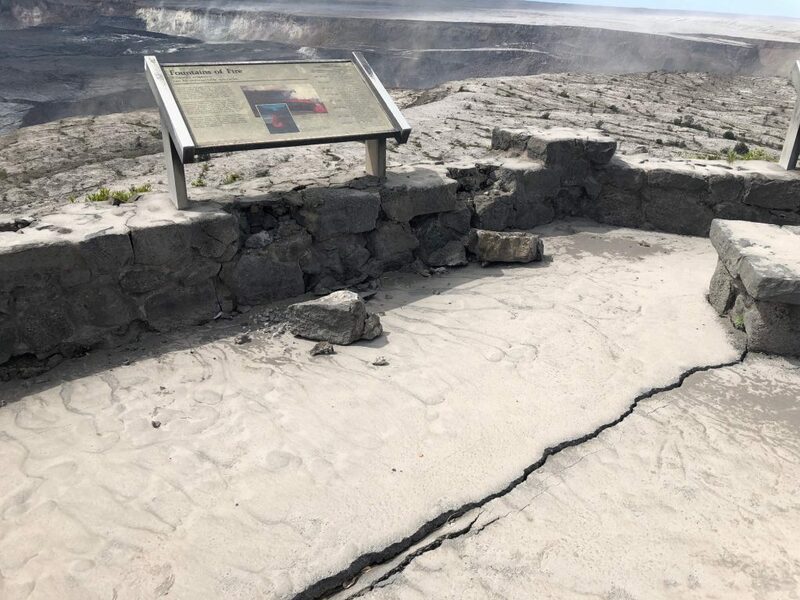 Much of Hawai’i Volcanoes National Park has been closed for three months due to hazards caused by frequent earthquakes triggered by collapse events at the summit of Kīlauea Volcano. Although seismicity decreased over the weekend, the temblors – more than 18,000 in the last 30 days – have wreaked havoc throughout the park. Those magnitude 5.0 and higher riddle Highway 11, other park roads, overlooks and trails with dangerous sinkholes and cracks. 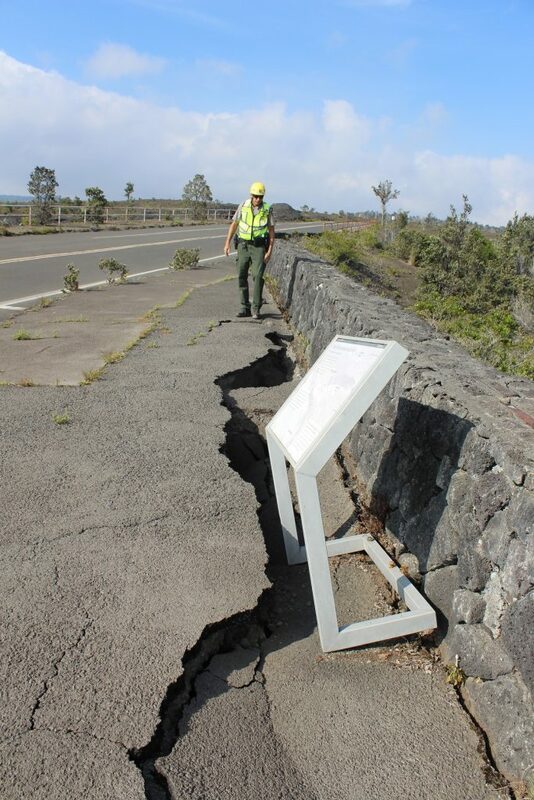 Jaggar Museum and the USGS Hawaiian Volcano Observatory buildings are damaged and stand empty.The summit crater, Halema’uma’u, has more than quadrupled in size as magma drains out to the lower East Rift Zone eruption outside the park. The new dimensions are staggering to those familiar with Halema’uma’u. Once 280 feet deep, it is now more than 1,500 feet deep in places. Its volume has increased to 800,000,000 cubic meters, according to USGS, an amount equivalent to about 300,000 Olympic-sized swimming pools. Without lava pressure supporting the summit, large and sudden collapses reshape Hawai’i Volcanoes National Park. More than 60 large collapse/explosion events have occurred since the park closed on May 11. The earthquakes also increase the risk of fire: broken waterlines have left most of the park without running water for fire suppression. Fixing them makes little sense as long as the earthquakes continue. Scientists say the activity could last months, even years. Only when the destructive earthquakes subside will the park be able to fully assess damages, clean up the mess and develop a strategy to reopen. 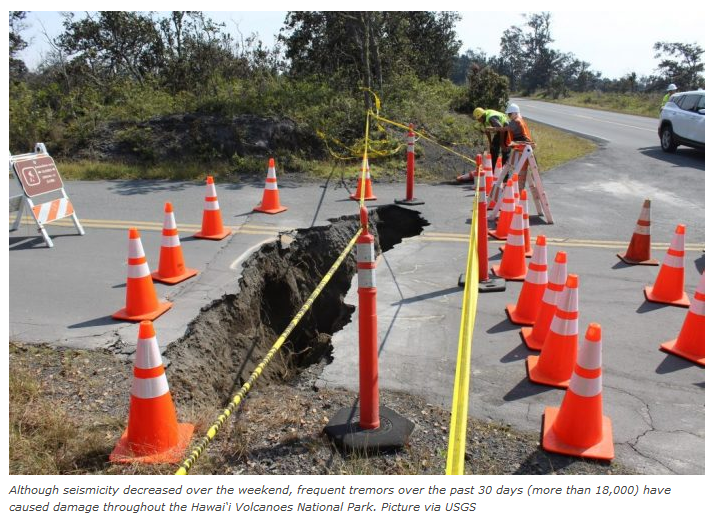 Large sinkholes and fractured asphalt on Highway 11 are being repaired by state highway workers, often necessitating one-lane closures and a reduced 25 mph speed limit. Government agencies are working together to create alternate and emergency routes should the highway fail. 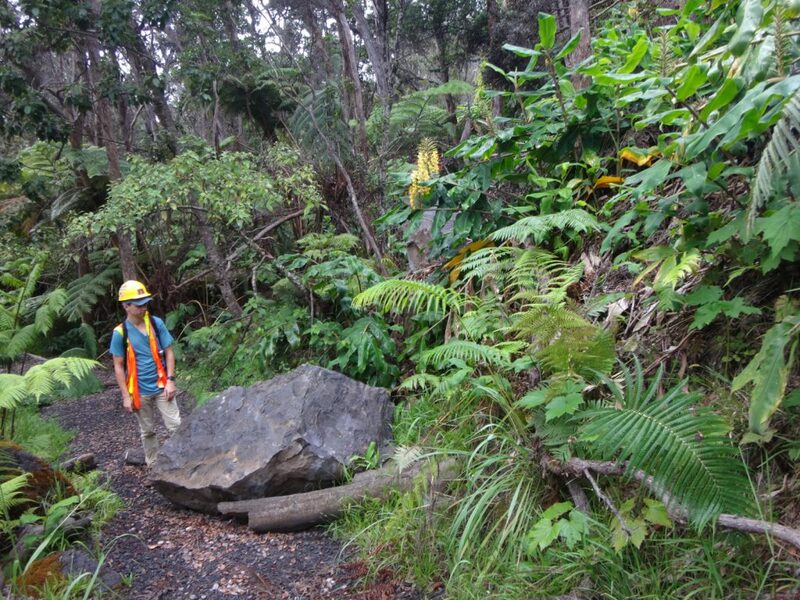 But the fate of park features like Thurston Lava Tube are unknown because it’s too risky to send anyone inside to take a look. While scientists cannot predict exactly when the eruptive and seismic activity will end, Hawai’i Volcanoes National Park invites everyone to explore how a volcanic landscape snaps back to life.